Story: After his fight with Sherlock Holmes at the Reichenbach Falls in 1891, Moriarty survived. He had originally been a MI-5 agent who's job it was to control the underworld, and after the fight with Holmes he was recalled by Mycroft Holmes. Moriarty became M at MI-6 but continued as crime-lord at the same time . In 1898 the threat from the competitor Fu Manchu (not named in the story) became too big. Fu Manchu who had stolen a rocket fuel called cavorite, which would give an competitive edge, and the League of Extraordinary Gentlemen was created to retrieve the fuel . The league succeeded in retrieving the cavorite but instead of using the cavorite for his own nefarious plans he ended up being shot into space and apparently died . Background notes: James Moriarty is the character created by Conan Doyle as Sherlock Holmes archenemy. 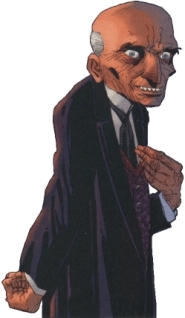 In Doyle's stories Professor Moriarty died fighting Sherlock Holmes at the Reichenbach Falls, whereas in Alan Moore's version he survived the fall.